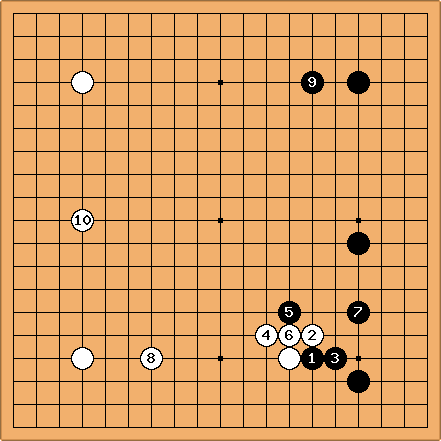 This formation is often seen in contemporary go, as a result of Black's adoption of the Chinese fuseki (see plays against low Chinese opening). We can assume a white 4-4 point in the lower left corner, meaning that White is pursuing an influence-oriented strategy consistent with the stones already played on the fourth line. 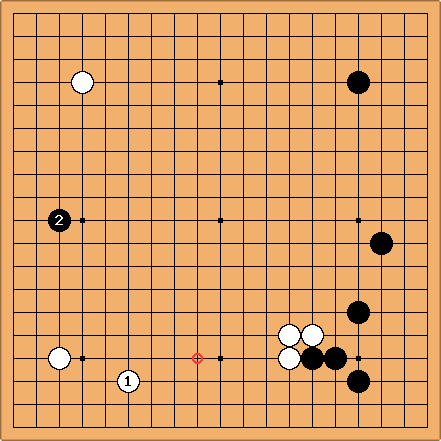 When it comes to further plays here in the middle game, what options does White have? 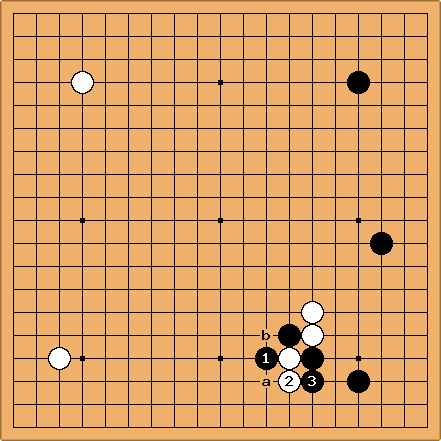 In pro games, White's cap at a is the most usual continuation. Black may well find it too passive to answer it directly. 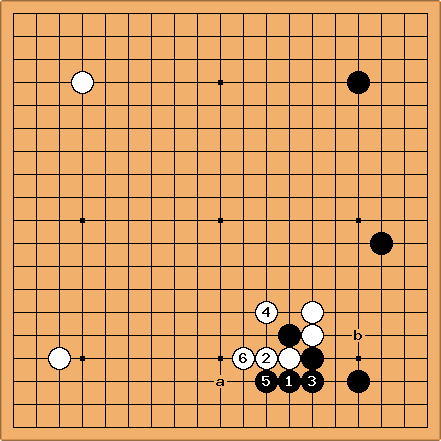 White also frequently uses the knight's move cap, which exerts control over a black framework in the upper right. Again Black may find it too slow to respond. White c is an interesting example of shape. A book by Shirae Haruhiko remarks that it is overconcentrated with the two-space extension White has made on the side: better to have three-space extension on the side and a one-space jump into the centre. White at d is therefore understandable - it tries harder. If Black ignores it White can easily invade. Finally White at e and f are typical probes. They are not very often seen in pro games - they go against the idea of an influence contest around here. 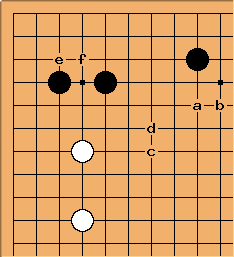 Whether White plays as shown, or at looking for territory, will depend very much on the fighting position on the rest of the board. 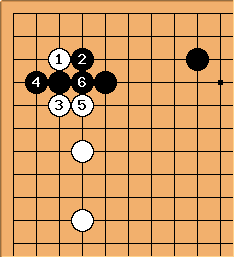 As shown White has converted the corner aji into some extra stones that make the left-side group much stronger. These days it will mostly be created when is played, rather than White at a; because if White starts at a Black's pincer at is playable. See 3-4 point distant high approach from the wrong direction. Charles I think is probably possible; but looks like an overplay (at b is expected). 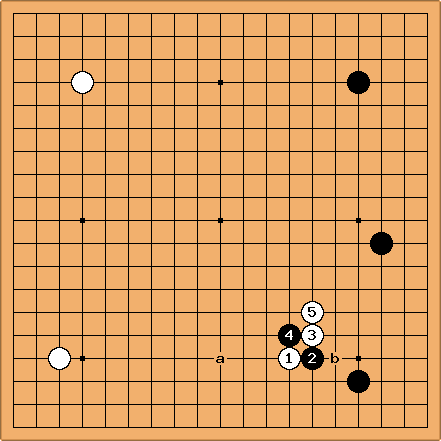 Now White has four ways to extend, and at first sight they all look reasonable. Charles I think Black has a bad result, now. Black has taken a little territory, but given White good influence; and now Black no longer has a strategy for playing on a large scale. Black at b has little effect on White. unkx80: My intuition calls for to . 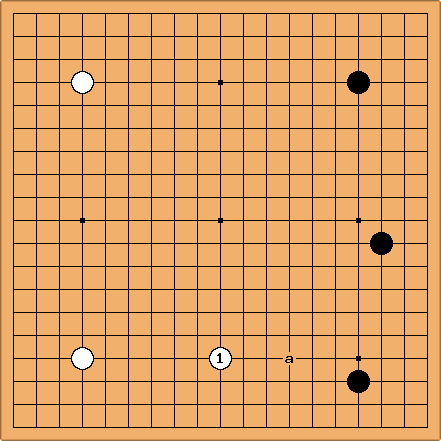 Then if White a, Black connects at b. This will lead to large scale fighting. Charles I agree that this is more consistent for Black, than the way in the game. It does feel to me, though, that here Black is driving White into his own framework; which is usually inferior to keeping White weak on the outer boundary of the framework. So I can't really agree with Black's plan for this game. But the fighting variation seems thrilling. Charles Supposing we reach this position, looks like the play on the lowee side. Then I think is normal. 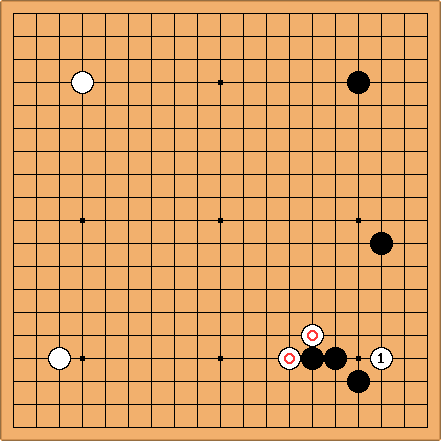 I don't see that Black has any particular problems in this game. Black at the circled point is a good attack in the near future. HelcioAlexandre How about this attack? Black won't get his territory. Andre Engels: No, but he will get tremendous influence. First making the opponent strong and then invading is rarely a good strategy. After this the two marked stones will be dead weight against a strong wall. Andre Engels: For what it's worth, the game shown here is the only professional game I can find where black attaches at .